Things are generally pretty quiet in the Stanton County Library in the small western Kansas town of Johnson City—it’s usually not until well after the library closes that the action picks up. That action is on the street outside, where area farmers and ranchers, farm workers, students, and other rural residents come to town and sit in their pickups to use the library’s Wi-Fi connection. It’s the modern-day equivalent of TV’s John Boy Walton taking the family’s 1929 Model A Roadster down the mountain to use the crank-up telephone in Ike Godsey’s general store. Rural America is again on the wrong side of a technology gap. The plea for better internet service in rural areas isn’t new—the digital divide has existed for decades because high cost and low population have dulled the business plans of private service providers. However, there’s growing indications that local, state, and federal policy makers, the telecommunications infrastructure, and even some private providers are beginning ‘to hear me now.’ Within the last year, the FCC announced a $1.5 billion addition to their $4,5 billion Connect America Fund, and the USDA announced a $600 million e-Connectivity pilot program, adding to their annual $700 million Rural Utility Services Fund. In addition, President Trump has pledged to “accelerate the deployment of affordable, reliable, modern high-speed broadband connectivity in rural America” and has named a task force and signed two executive orders to that end. The pending 2018 farm bill also contains the Precision Ag Connectivity Act which adds more funding and encourages development of the mobile broadband capability needed not only at rural households, but also in farm fields and rangelands. The FCC’s coverage map uses data from internet providers. Dark blue areas have three or more suppliers, dark green two, light green one and yellow none. 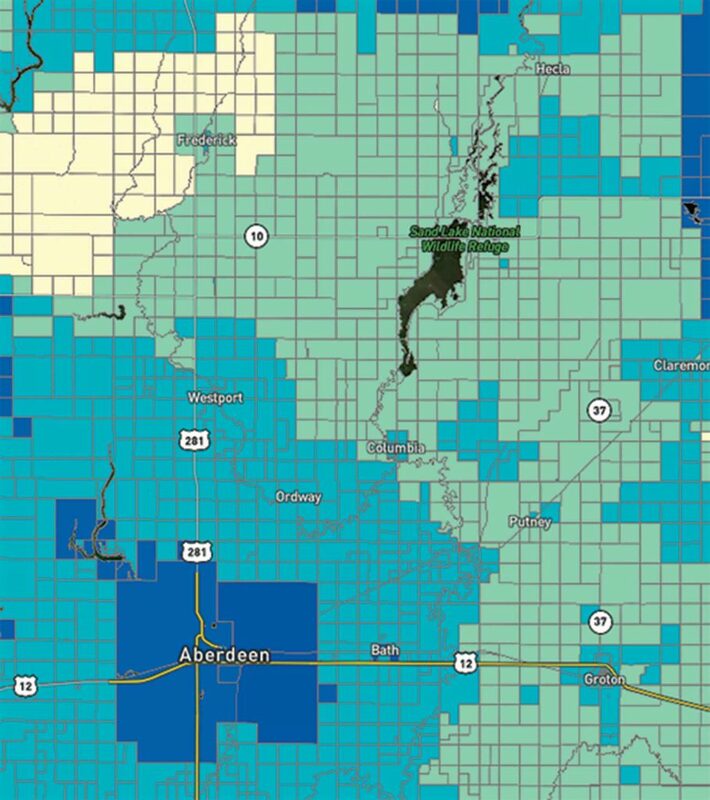 The American Farm Bureau is concerned about errors in this map, such as Brown County, South Dakota (below), which has a large unserved area despite showing up as having two suppliers. Getting connected. The methods for providing broadband internet include DSL (Digital Subscriber Line) which employs unused telephone wires; cable from a local cable television provider; satellite; wireless (fixed or mobile); and fiber-optic. Dial-up is not considered a broadband option, though it’s all some rural areas get. The FCC requires that internet connections provide at least 25 Mbps (megabits per second) download speed and 3 Mbps upload speed to qualify for their grant and loan programs. Fiber-optic service—considered the gold standard for broadband use—has speeds of 100 Mbps. Speeds of 1000 Mbps (1 gigabit) are available in many urban areas. National Rural Electric Cooperative Association (NRECA) reports that nearly 100 of their members are already installing broadband networks both to manage their own power grids more efficiently and to provide high-speed access to their rural owners. fiber-optic networks. Tri-County REC in Mansfield, Pennsylvania, serves as an example of the impact. Expensive options. The FCC estimates that closing the digital divide in rural America will cost $40 billion. Last year, Microsoft hired the Boston Consulting Group to put a pencil to the same effort using various delivery methods. The study found that connecting all rural users with fiber-optic—at a cost of $30,000 per mile—would be $45 to $65 billion; a satellite-based system $30 to $45 billion; a fixed 4G LTE wireless system $15 to $25 billion; and a higher frequency 5G wireless system $25 to $40 billion. Microsoft’s Rural Airband Initiative proposes the use of a service that utilizes unused low-end TV channel frequencies left idle when television stations switched from analog to digital broadcasts. The estimated cost of this “TV white space” option came in at $10-$15 billion. The study found that deploying a mix of these technologies on a county by county basis could lower the cost to $8-$12 billion. Recently, other broadband distribution systems have also been revealed. Alphabet—the parent company of Google—proposes Project Loon, which uses high-flying helium-filled balloons each sending signals to a 5,000 square mile area as they float along. Also, Elon Musk—of Space-X and Tesla fame—has proposed a network of 4,000 low-altitude satellite stations. A wise investment. The price tag on any of these options is considered beyond what customers can pay, so public involvement similar to the Rural Electrification Act of the 1930s will likely be required. Several studies indicate that would be a good investment. Zach Hunnicutt serves on Nebraska’s Rural Broadband Task Force which will provide recommendations on how to get high-speed internet to all the state’s rural areas. NRECA lead economist Russell Tucker found coop members would benefit an average of $1,950 annually if they had broadband internet. A 2015 study by the Appalachian Regional Commission determined 80 new jobs would be created for every 1,000 new broadband users and that an increase in service of 4 Mbps added $2,100 to household income. Also in a recent study the Purdue Center for Rural Development estimated a $12 billion benefit to bringing high-speed internet to all of rural Indiana. On the heels of that report, the state legislature promptly approved $100 million towards that goal. Back in Johnson City, Kansas, library director Colleen Kilbreath accommodates the latter by leaving Wi-Fi on overnight. “Most libraries turn it off, but last year we got 25,537 hits on it,” she says. Precision roadblock. In many areas the expanding capability of precision agriculture is throttled by the lack of broadband access. Giltner, Nebraska, farmer Zach Hunnicutt knows that first-hand. “We’ve been using precision ag technology for some time and know it’s made our operation more efficient and environmentally friendly. However, last summer our local telephone company ran fiber-optic to us and that has allowed another step forward with this technology on the 2,500 acres we farm,” says Hunnicutt. then downloaded for analysis. The fiber connection costs $100 per month and features speeds of 125/20 Mbps down and up. 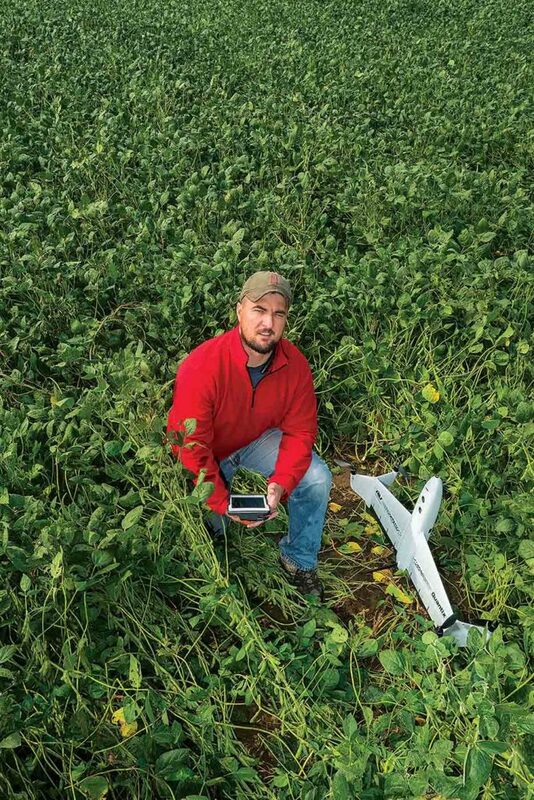 “We fly the fields frequently to monitor the crop and each time results in 20 to 25 gigabits of data. With our previous DSL connection it would take three days to upload that data, but now it takes three hours. That makes it much more feasible,” says Hunnicutt. Coverage concerns. Governmental grants and loans are typically awarded to areas that the FCC thinks have the greatest need, but American Farm Bureau is questioning the data used in the decisions. The map at right is the FCC’s broadband coverage map that uses data submitted by internet providers. Farm Bureau economist Veronica Nigh points out errors in that map. “On the map, Brown County, South Dakota appears to have ample coverage from at least two providers, but upon closer look there is actually a large part of the county that has no coverage. Much of this is cropland and the lack of broadband access makes it difficult for farmers to utilize many of the latest precision farming techniques that require data collection and analysis. Long-term, this could have a negative impact on land prices,” says Nigh. “We’re concerned about how carriers are allowed to report their coverage because it’s often not what the map shows. This could impact where funding goes,” says R.J. Karney, director of congressional relations for Farm Bureau. Karney explains that carriers report by census blocks, so if one household in the block receives the required 25/3 Mbps service that area is considered covered. “In some rural areas there are census blocks as large as Connecticut, so that is a problem,” he says. The FCC allows challenges to the coverage map, and four state Farm Bureaus (Kansas, Nebraska, Missouri and Mississippi) have gotten the waiver to do so. Their members are asked to run the Speed Test app downloaded from the Apple Store or Google Play. To date, 2,700 tests have been run in Kansas and 1,200 have failed.